It had been awhile since our last visit to Germany and the idea of a short break in Frankfurt appealed as it was a city we were unfamiliar with. Our flight with Ryanair was from Manchester airport and we stayed overnight at the Ancoats Travelodge getting the holiday off to a good start. The hotel is conveniently located in the city centre and we spent a couple of hours in a nearby pub finalising our travel itinerary over a delicious creamy mushroom risotto. The next morning we had time to enjoy a full English breakfast before taking the train out to the airport. 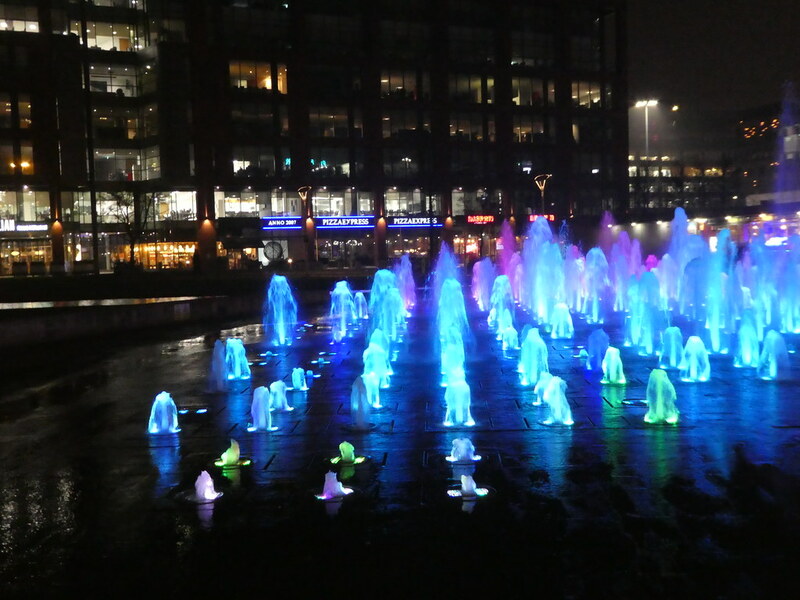 Trains to Manchester airport from Piccadilly station are frequent with the fastest services taking only 12 minutes. Off-peak single tickets cost £3.80 and if, like me, you plan on making several journeys with the same person during the year, a Two Together Railcard offers a third off fares. Arriving at the airport’s railway station, it was then a 12 minute walk across to Terminal 3 (the furthest terminal from the station). 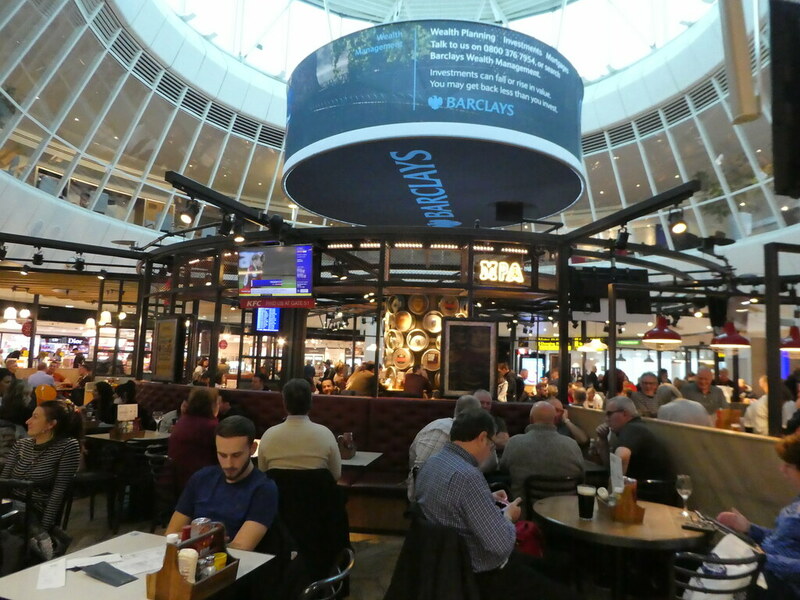 This is the smallest of Manchester’s terminals with a limited choice of facilities but we found some seats in one of the airside cafes and settled down with pre-flight drinks before going to our gate. Our flight was with the low cost airline Ryanair, and although they get a lot of bad press, they are very reliable and always seem to get us from A to B on time. The short flight over to Frankfurt-am-Main airport took only one hour and twenty minutes which was just enough time for me to read the two newspapers I’d picked up before boarding the aircraft, Our plane parked in a remote spot on the very edge of the vast airport necessitating a 15 minute shuttle bus ride to the terminal building. Fortunately we had been sitting near the back of the aircraft so we were amongst the first passengers to board the bus and managed to get seats. Frankfurt airport is the busiest in Germany and 4th busiest in Europe. It’s also very efficient as we sped through the e-gates at immigration and were soon heading up the escalators to the main entrance of the arrivals hall. 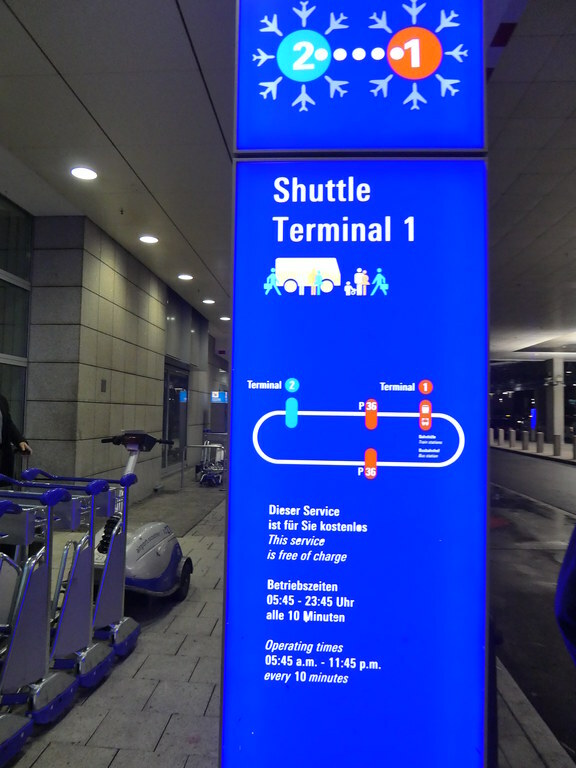 From there, we caught a free shuttle bus to the airport railway station which is located below Terminal One. On arrival at the station we obtained two single tickets to Frankfurt Hauptbahnhof (Central Station) which cost €4.95 (£4.39) each. These suburban trains (either S8 or S9) run at 15 minute intervals and take approximately 12 minutes into the city centre. 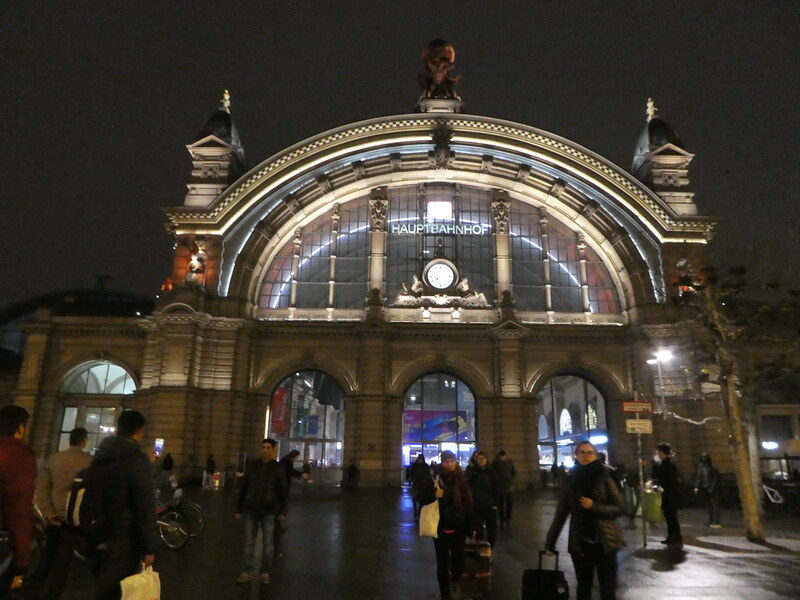 Arriving into the central station, an Italian market was taking place in the main concourse and as the Tourist Information was still open, we called in to pick up a few maps and our 2 day Frankfurt Cards which we intended to use from the following day. Our hotel, the IBIS Styles Frankfurt City on Mosel Strasse was just a few minutes walk from the station and conveniently situated near to the riverside. 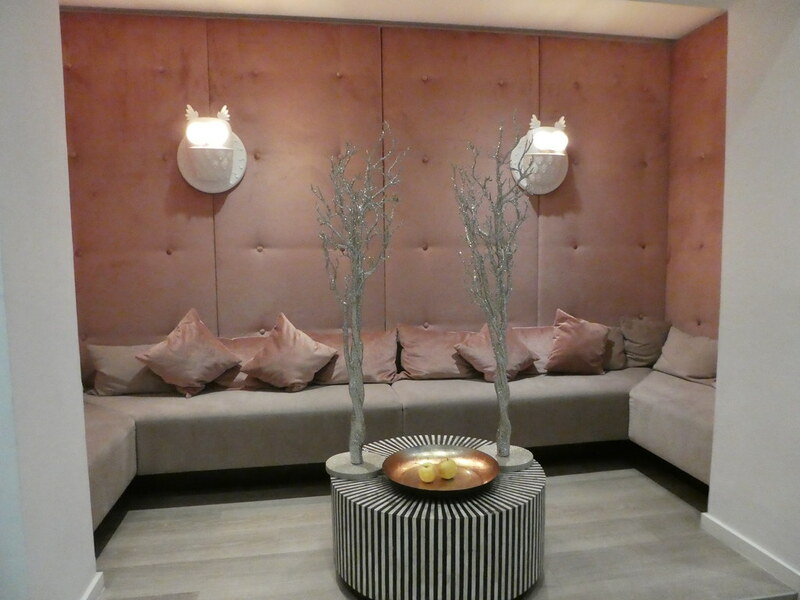 The hotel had an inviting, modern decor and it only took a few minutes for the friendly receptionist to check us in. Our room on the top (7th) floor was of a good size and pleasantly furnished. Unusual for an IBIS, the room came with its own balcony but I was uncertain how useful it was going to be for us in freezing cold January. After several hours without food we had started to feel hungry so we quickly freshened up and then set off to find somewhere for dinner. Although there were numerous restaurants near the hotel, none of them appeared to be offering authentic German cuisine so we wandered along to Römerberg Square, the splendid centre of the old town. 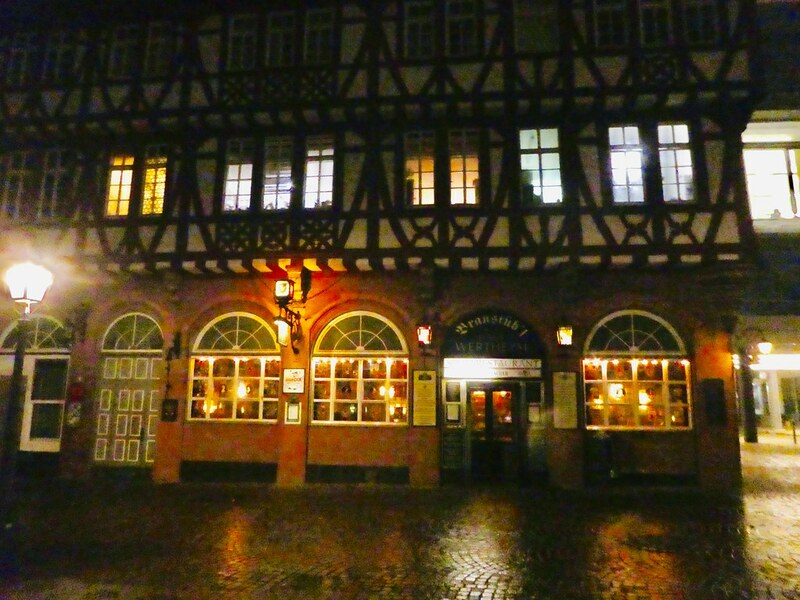 It didn’t take us long to find a traditional pub in a half timbered building just off the main square. 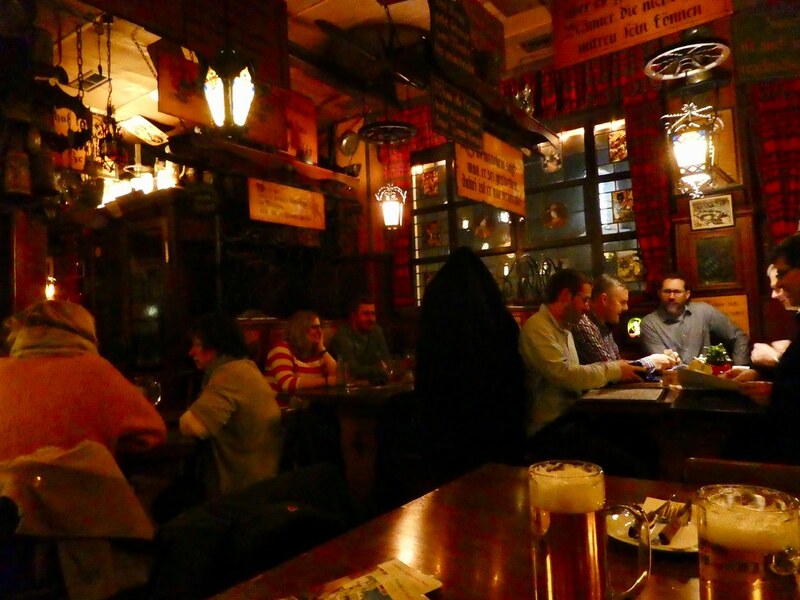 Haus Wertheym was just what we had been looking for, small and cosy with schnitzel on the menu. We both ordered our favourite pork schnitzels which came with salad and chips and our half litres of draft pilsner hit the spot nicely. Shortly after we arrived the pub filled up so I’m glad we didn’t delay setting off. The food was simple, cooked to perfection and my pork sprinkled with a wedge of lemon had a zesty flavour and moist texture. Total bill for two people €35 (£31). After lingering over our drinks awhile, we braved the cold and slowly wandered back to our hotel, just stopping on the way to buy a litre of milk for our weekend tea making. 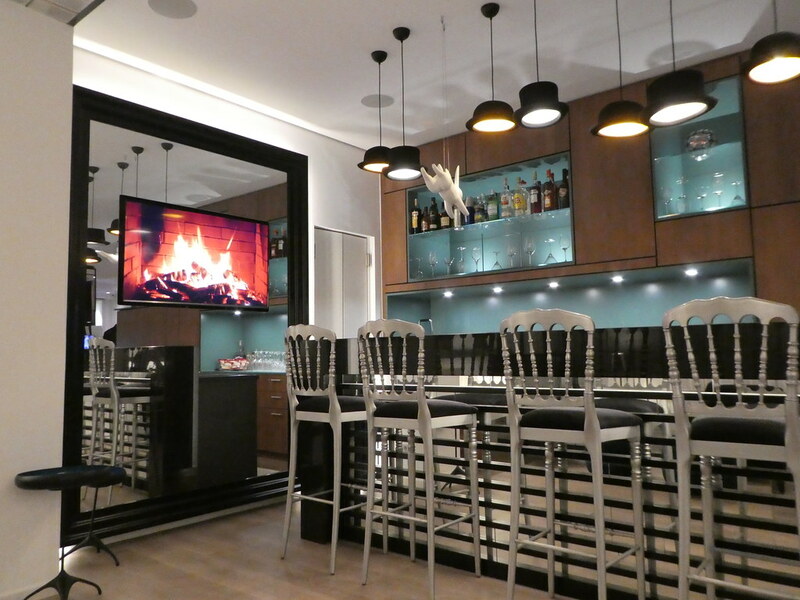 Neither of us felt tired, so we dropped off our coats and shopping in the room, picked up our iPads and settled down with glasses of wine in the hotel’s attractive bar for awhile, planning our next day’s activities. Thank you, I’m glad you enjoyed this post. Thanks Jason, I’m sure you’ll get an opportunity to pop over to Frankfurt and see it for yourself before too long as it’s such an interesting city. Thanks Anna for your kind words and suggestions. I’d love to return back to Frankfurt in the summer months and the thought of relaxing on one of those riverside sun loungers sounds blissful. We love Frankfurt. We have visited there many times buying clothes. They are cheap and their quality is excellent. There is a long street full of boutiques which sell nice cloths. My loves to buy clothes, because they are just tailored to her measures. Same is valid for me also. Thank you for taking an interest in my recent posts on Frankfurt. It’s good to read that you enjoy visiting the city especially for shopping trips! Wishing you a good week ahead Matti! Thanks Marcus, we didn’t have time to do much on the first day but made up for it on other days it was a lovely weekend away! Thank you for taking an interest in my series of posts on Frankfurt where we found lots of nice things to see and do. Frankfurt was very often a transit airport for me during my travel years but I never had the time to look the city over so your blogs help fill in some of the details. Thank you! I had only been in transit in Frankfurt before so it was good to be able to spend time there and explore the city. Thank you for your much appreciated thoughts. Thank you Marsi, Frankfurt is a very attractive city. Thank you so much Theresa for your kind words, they are much appreciated. Oh this post put a huge smile on my face, we loved Frankfurt. I’ll look forward to seeing what you discovered. I’ve also found Ryan Air to be just fine for shorter flights, no frills but they don’t claim to be anything else. Thanks Helen for taking an interest in this post. Frankfurt was so nice and we found lots to do. I don’t know why Ryanair gets such a bad press. We like it because it offers us the opportunity to visit so many different European cities for no more than a train ticket to London or Edinburgh! Used to frequently visit Frankfurt on business but haven’t been back in over 20 years so I’ll be interested to read all about your trip. Thanks for taking an interest in this series of posts on Frankfurt, Sheree. Your comments are much appreciated.